Show data block history: The history of data manipulations is stored within the spectral multifile. In order to view this information select ' File info → show history' and select the data block of interest. 1. data source, time and data of import (block of original data). Additional information is available from the log-file. Detailed information on the data parameters is available in the following chapter of this help manual. Additionally, the data parameters can be modified using the function Edit Parameters of the 'File Info' menu bar. This option can be used to change and modify parameters and metadata of the currently active HSI data file. The 'Edit parameters' window is available by selecting the option 'Edit parameters' from the 'File info' menu bar. and YDI which denote the number of pixel spectra in x-, and y-direction of the given HSI (see below) for details. Parameters highlighted by red color should be carefully modified since these parameters are used by the CytoSpec software. Modification of these parameters may cause malfunctioning. Changes of the parameters highlighted by red color are tracked and checked when leaving the 'Edit parameter' window. In case of errors or data inconsistencies an error messages will be displayed. The CytoSpec program also makes suggestions of how to change incorrect HSI parameters (see command window below). 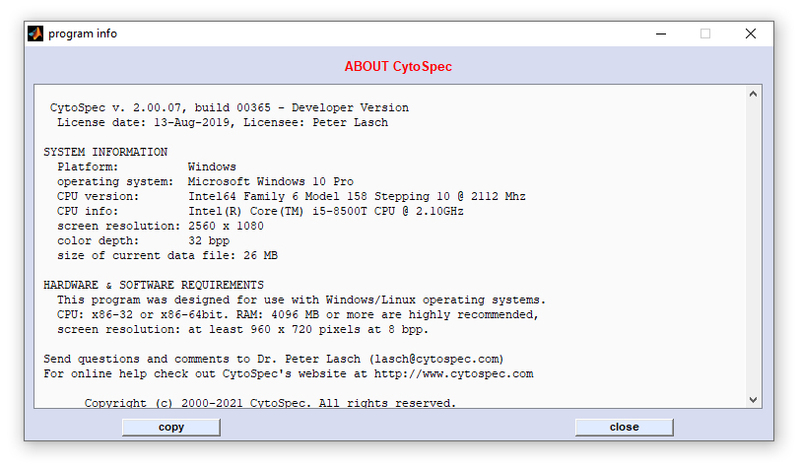 This function shows, among others, the CytoSpec program version number and the license information. 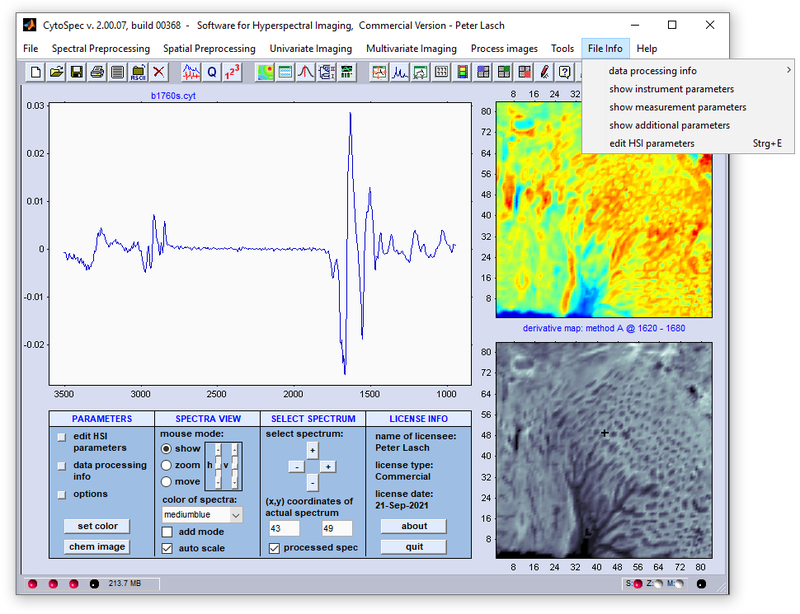 Screenshot of the ABOUT window. Use 'copy' to copy the 'About' info to the clipboard (64-bit versions only).